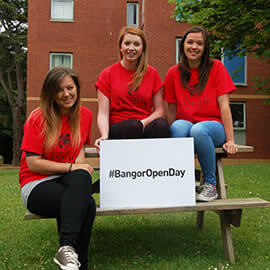 There’s no such thing as a “typical student” that’s why Bangor has something for everyone. The city itself is small and welcoming which means it’s easier to make friends but large enough to be able to offer you all you need for a happy and fulfilling student life. Visit the Student Life pages for more information. Moving away from home can be a big step so you don’t want to be worrying about finding a place to live. That’s why first year students who choose to study at the Bangor University are guaranteed a place in one of the 2,000 rooms available in our halls of residence. Visit the Accommodation pages for more information. There are no up front tuition fees, the payment is deferred until after you graduate. Students from England and Wales could recieve means-tested grants of up to £2700 and apply for a Student Loan to help cover you living costs. Also, extra financial support is available! Visit the Undergraduate Finance pages for more information. Market research shows that the cost of living in Bangor is much lower than in other parts of the UK. According to The Independent’s A-Z of Universities and Higher Education Colleges, Bangor is “one of the cheapest places in Britain” to be a student. Visit the Postgraduate Finance pages for more information.